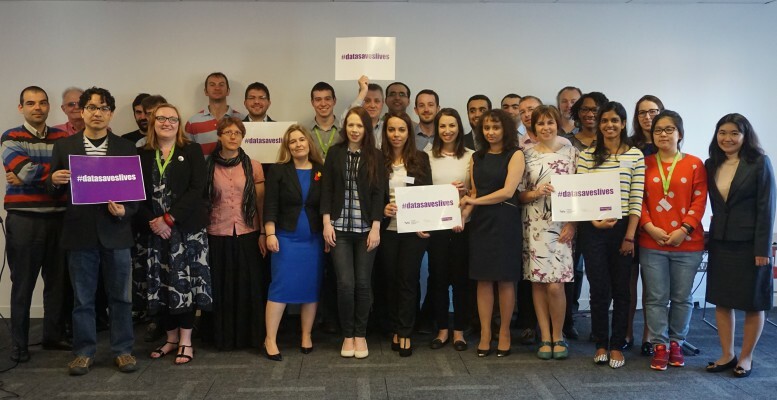 On the 9th and 10th June the next generation of health informaticians from across The Farr Institute’s four UK-wide centres came together for the first annual Farr PhD Symposium. In total twenty-six students from ten universities participated in the event alongside a host of PhD supervisors, investigators from across The Farr Institute and a variety of world-leading researchers, including president of the Royal Statistical Society Prof. Peter Diggle, Director of Farr@HeRC Prof. Iain Buchan and David Robertson, Professor of Applied Logic and Dean College of Science and Engineering at The University of Edinburgh. Throughout the two days each student was tasked with delivering an oral presentation or a poster to their peers in front of a panel of judges looking to award prizes in two key categories: ‘Best PhD Presentation’ and ‘Best PhD Poster’. The presentation judging panel included Dr Niels Peek from The University of Manchester, Dr Corri Black from The University of Aberdeen and Dr Spiros Denaxas from University College London. Following some tough competition and a series of challenging questions from the judges, Glen Martin from The University of Manchester took home the ‘Best Presentation’ prize for his research in Transcatheter Aortic Valve Implantation (TAVI) and Hospital Readmissions. Using data from the British Cardiovascular Interventional Society, Glen’s PHD is seeing him develop a model that will predict clinical risk for patients with aortic stenosis. The ultimate aim of Glen’s research is to investigate the causes of hospital re-admissions of patients undergoing TAVI procedures. The ‘Best Poster’ prize as judged by Prof. Colin McCowan (University of Glasgow), Dr Matt Sperrin (The University of Manchester) and Prof. Rob Stewart (King’s College London) went to University College London’s Ania Zylbersztejn who presented her research investigating why childhood mortality in the UK is so high in comparison to other European countries. By linking administrative data Ania was able to compare childhood mortality outcomes in England against those in Sweden. She is now trying to identify where any disparities might originate. The event was organised and delivered by The Farr Institute’s Capacity Building team. With demand for high-quality health data scientists outstripping supply, Capacity Building is one of the Farr Institute’s key objectives. The team are committed to addressing this industry-wide skills shortage by creating a pipeline of highly-skilled health informaticians, capable of capitalising on the UK’s current world-leading position in eHealth research. “The PhD Symposium was a great opportunity for our students to come together as a community and share ideas, compare research methods and help strengthen the UK’s health data network. Farr Institute PhD student Natalie Berry said: “I had a great time at the PhD Symposium; it was lovely to be able to get to know the other PhD students across The Farr Institute a bit better and fascinating to see the range and scope of research taking place in the health data science arena”. Throughout the event each students was invited to produce a short video highlighting their research. These videos will be made available on The Farr Institute website in the next few weeks. Following the Symposium, the PhD students will gather at the end of summer to attend the Farr Institute Summer School before the annual Farr Institute International Conference takes place on the 26-28th August 2015. Alexander Pate, The University of ManchesterThe design of point-of-care trials that use routinely collected data: evaluation of the Trials within Cohorts (TwiCs) design implemented in a Cluster Randomised Trial (CRT) framework. Andrea Fernandes, King’s College LondonHow do Treatments for Depression effect Suicide and Suicidal Behaviour in Major Depression? Natalie Berry, The University of Manchester How we can use technology to deliver interventions for people who experience serious mental health problems. Anthony Chapman, University of Aberdeen A computing approach to understanding relationship s between antenatal fetal ultrasound measurements and postnatal outcomes. Anna Zylbersztein, University College London Why are childhood mortality rates in the UK so high? An inter-country comparison between England and Sweden using linked administrative data.